Australia stayed silent about human rights abuses in Sri Lanka in exchange for its co-operation in cracking down on people-smuggling, Colombo’s new Prime Minister Ranil Wickremesinghe said in an interview published Monday. Wickremesinghe said former president Mahinda Rajapakse had agreed to help stop boats carrying asylum-seekers leaving for Australia if Canberra kept quiet about alleged abuses by Rajapakse’s regime. In an interview with The Australian newspaper, Wickremesinghe said Australian Prime Minister Tony Abbott’s close relationship with Rajapakse, who was voted out of power last month, was “a mystery” to Sri Lankans. Colombo’s new premier also said that “people connected to the previous government” had taken part in people-smuggling operations. “It was being done by people with Rajapakse connections, but once this deal was done between Australia and the Rajapakse government, where you looked the other way (on human rights abuses), then the secretary of defence got the navy to patrol,” he told the paper. The arrival of asylum-seekers by boat is a sensitive political issue in Australia, which in 2013 started sending those picked up on boats to offshore camps on Papua New Guinea’s Manus Island and Nauru. Most asylum-seeker boats that have made the precarious journey to Australia came from Indonesia, but 120 left from Sri Lanka in 2012 and the two nations have more recently been cooperating to crack down on people-smuggling. Wickremesinghe said he was not against the Australian government, but urged them to learn from their experiences. “Some other countries must also, that fully backed the Rajapakse regime,” he told the newspaper. Sri Lanka’s new government has promised a domestic probe into alleged war crimes under Rajapakse. 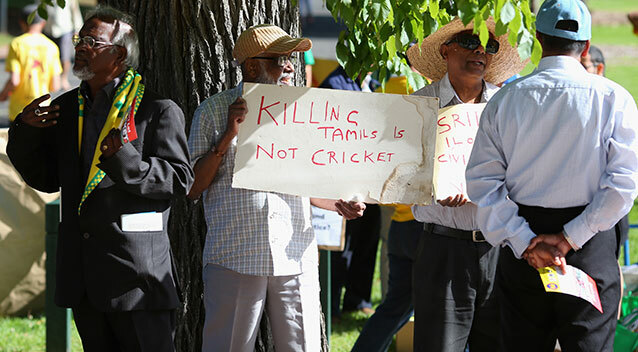 The previous government had resisted a UN inquiry into claims that up to 40,000 ethnic Tamil civilians were killed in the final months of a war that ended in May 2009. Ahead of travelling to Sri Lanka in 2013 for a Commonwealth summit, Abbott said he was “not inclined to go overseas and give other countries lectures” but he would be urging Colombo to “respect everyone’s rights”. A spokesman for Abbott said Monday that relations with Sri Lanka remained strong. “The prime minister looks forward to Australia and Sri Lanka?s continued cooperation on a range of issues — including on the Commonwealth, and on people-smuggling,” the spokesman said. Wickremesinghe said his government had a mandate to work towards reconciliation with the country’s Tamil minority, as he confirmed that hundreds of citizens detained without trial under the Prevention of Terrorism Act would soon be released. The new administration has said it was working on releasing some 275 Tamil prisoners who have been held in custody for long periods without any charges. “We are getting a final list from the defence ministry, armed forces and police and we will, after verifying, issue a final list of people being held in custody by different agencies of Sri Lanka,” he said.